• Shrimp - 500 grams. • Grated coconuts - 1 cup. • Onion - 1 0. • Green chilli - 3 numbers. • Red chilli and cumin seeds soked - 2 numbers. • Garamasala powder - 1/2 teaspoons. • Turmeric powder - pinch 0. • Pepper powder - as per taste 0. • Sugar - pinch 0. • Chopped tomatoes - 2 numbers. • Mustard seeds - pinch 0. • Whole garamasala dry - 2 numbers. Heat oil in a heavy pan add garam masala whole, add chopped onions, salt and cook till they are golden brown. Add water to the consistency of the gravy you need and add shrimp and cook for 7-10 min. add pinch of sugar add gr chillies and check seasoning. Finish off with coriander leaves enjoy with a bowl of rice. Goan Shrimp curry, an scrumptious seafood delicacy influenced from the Portugal cuisine. Coconut milk, rice and chillies are main ingredients of Goan delicacies which are often spicy and gives an intense flavor to the soft shrimps. Goan cuisine includes native meals well-known in Goa. Goan meals are really distinct from the meals of other locations which is related to its vibrant and various cultural traditions. A lots of Goan recipes like Prawn balchao and Sorpotel are very well recognized and appreciated all over the world. The four hundred years of Portuguese colonialism and also the Islamic rule that preceded the Portuguese. Numerous Cath... Read More.. The four hundred years of Portuguese colonialism and also the Islamic rule that preceded the Portuguese. Numerous Catholic recipes are generally much like or variations of the Portuguese alternatives both in naming or their usage of ingredients. The Portuguese unveiled potatoes, tomatoes, pineapples, guavas, and cashews from Brazil to Goa and so India. The chili pepper is an essential part of Goan delicacies. The delicacies of Goa are affected by its Hindu, is especially lacto-vegetarian. Hindu food primarily makes use of significantly less heat, jaggery for sweetening and tamarind and kokum for souring. It makes use of asafetida, fenugreek, curry leaves, mustard, and urad dal. It's not extremely spicy; less onion and garlic are utilized. In addition, it consists of more fresh vegetables, for example lentils, pumpkins, gourds, bamboo shoots, roots, and so on. It's much less oily and also the moderate of cooking is coconut oil. Rice, seafood, coconut, veggies, meat, pork and local seasonings are among the primary ingredients in Goan delicacies. The region is situated in an exotic environment, meaning that spices and tastes are intensive. Usage of kokum is yet another unique characteristic. Goan meals are regarded as imperfect without fish. It's just like Malvani or Konkani delicacies. The food is mainly seafood-based; the staple foods are rice and fish. Kingfish (vison or visvan) is regarded as the popular delicacy. Other seafood consists of pomfret, shark, tuna, and mackerel. Among the list of shellfish are crabs, prawns, tiger prawns, lobster, squid, and mussels. Goa really attracts non-vegetarian meat lovers. Goa’s most popular sweet is Bebinca. This sweet is a multi-layered cake made out of egg, coconut milk, sugar and ghee. Cooking an ideal bebinca is regarded as an art form. Lots of endurance is required during the time of its planning because the next layer are only able to be added in after the earlier layer has been cooked. This is often eaten cold or hot and it is customarily offered at Christmas. The food of Goa is a delectable expression of their historical background and heritage. Traditional Goan food is among the largest factors tourists flock to this wonderful state. It is spunky; it offers personality and it is significantly addictive! thank you chef for sharing your secrets... i will surely try this out. 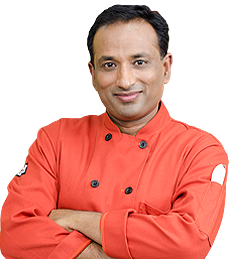 Chef, the grinding shrimp with Masala was master trick, came out really good, I did not have Vinegar still tasted superb..Thank You !! dude.. its a huge hit with our party. i am proud that you are from Andhra too. It turned out just awesome. I made a shrimp curry first time in my life and got complimented by a Goanese! Adding shrimp to the masla made a real difference. Thanks !! !